For most of my life, I was firm in my stance on peas: I hated them. I picked them out of my samosas; rejected them steamed or boiled, fresh or frozen. And then, last year, I had the great fortune of giving peas another shot. It just took a spoonful of tender tinies, with a dash of salt, and I was hooked. I loved peas. They were so healthy, colorful, sweet, and versatile! My love affair with peas has not faded over the past year, and I include them in as many recipes as I can. Not only are they bright and sweet, but they are incredibly healthy - the perfect cross between vitamin-rich vegetable and fiber-rich legume. I'm not sure where I got the idea for a pea pesto, but it sure was a good one. My pea pesto is very simple and includes just about all of the ingredients for a traditional basil pesto in addition to peas. I usually serve it on pasta, both because of its creamy texture and because the sweet pea flavor is a perfect complement to whole grain pastas, such as whole-wheat linguine or even sprouted wheat pasta (Trader Joe's sells reasonably-priced sprouted wheat papardelle that we buy in quantity). Any extraneous pesto makes a delightful dip for pita chips or spread for sandwiches. Here is my rough recipe for pea pesto - I haven't included precise measurements because I usually just adjust the proportions as I go. I do, however, start with 2 cups of peas for 3-4 pasta servings. Defrost peas in the microwave. Combine warm peas and the rest of the ingredients in a blender or food processor, and blend until smooth and creamy. Add a bit of pasta water if the pesto is too thick. When I'm feeling particularly inspired, I serve the pesto and pasta with a generous sprinkling of toasted walnuts on top. Lemon zest would also be lovely. 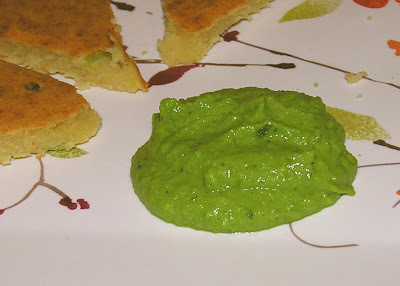 In the picture below we served the pesto as a dip for homemade farinata wedges (recipe and post coming soon). Enjoy! I have been anxiously awaiting your most recent post, and as usual I remain your biggest fan. I made oven baked fries seasoned with fresh dill, oregano, pepper, and kosher salt. I tossed with olive oil. Still, I thought they were bland and not at all like the Evson fries that I love. Ideas? Probably fresh garlic would do the trick?